Newtabtools.com is the PUP that uses misleading techniques to prevent removal. Use Reimage to locate malicious components and get rid of them faster than with uninstall instructions. A full system scan blocks virus reappearance and prevents traffic to malicious domains. 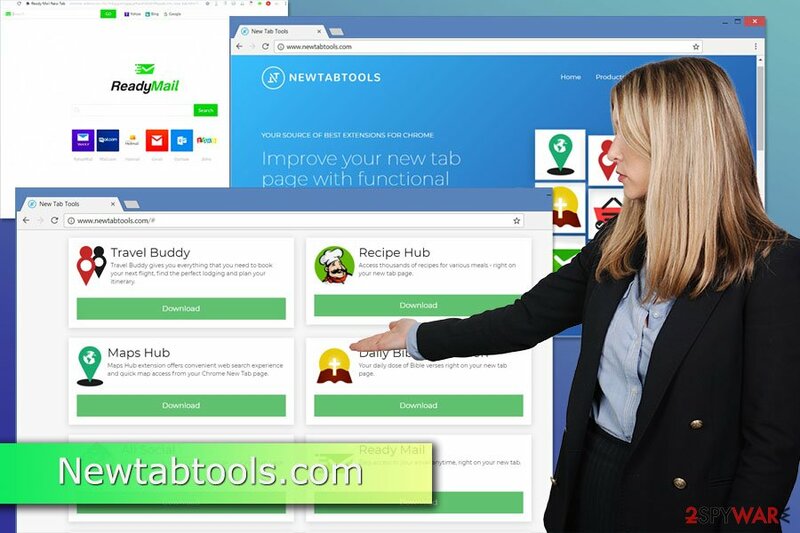 Newtabtools is a group of browser hijacker that spread bundled with various free programs in the form of browser extensions. After infiltration, this potentially unwanted program (PUP) after infiltration might set Newtabtools.com or another Yahoo-based search engine as the default homepage, built-in search box, and new tab URL address. To uninstall Newtabtools.com install Reimage and run a full system scan. Improve your new tab page with functional extensions that suit your needs for a better browsing experience. However, it’s important to mention that Newtabtools.com virus cannot harm the system directly. The program is designed to take control over web browser in order to shift user’s browsing habits. It means that hijacker might control what ads users see, what links they click and what websites they visit. There’s no doubt that this activity is highly annoying. However, in this way authors of this cyber threat generate advertising-based revenue. But the problem is that hijacker might put users in danger. Some of the commercial content might not be safe to click. 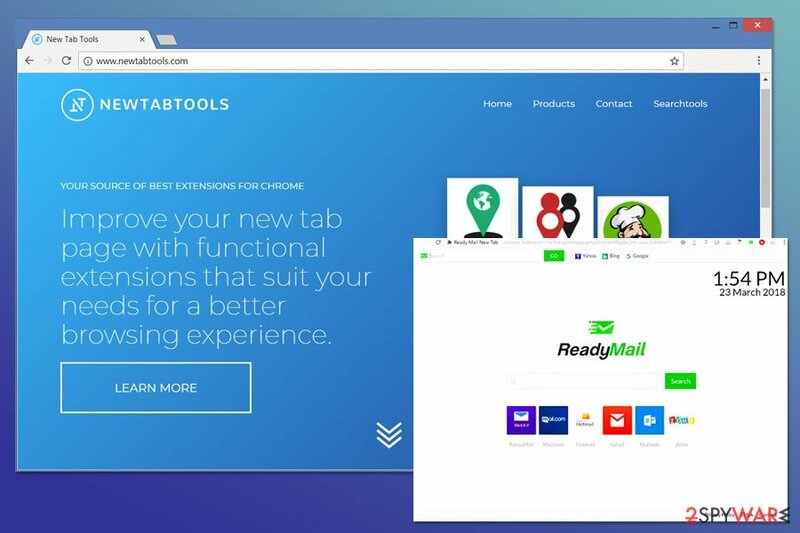 Security specialists from LosVirus.es warn that Newtabtools redirect tendencies might end up with malware infiltration or suffering from a phishing attack. The hijacker can display misleading ads or force users to visit potentially dangerous websites. This might happen because potentially unwanted programs are often exploited by cyber criminals. Unfortunately, developers of PUPs rarely care about possible dangers that might be exposed to the users. Though, your privacy and security are in your own hands. Thus, in order to be safe online, you have to remove Newtabtools from the computer. Newtabtools.com removal can be completed either manually or automatically. We suggest opting for the latter method and let Reimage or another anti-malware program to get rid of the hijacker. However, after system scan, you should also reset Chrome and other affected browsers to delete tracking cookies. Newtabtools.com is a browser hijacker that can enter the system with the help of free programs. 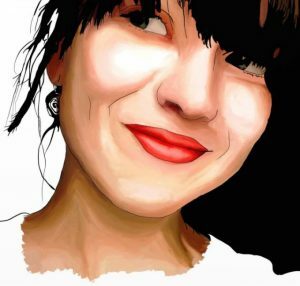 This Chrome extension is available to download on the official developer’s website Newtabtools.com. However, it’s not likely for users to encounter this website when looking for a new tool to enhance the browsing experience. Usually, Newtabtools hijack surprises people when they open the browser after installing freeware or shareware. This potentially unwanted application might be advertised as an optional component in any software package. However, users who stick to Custom/Advanced installation settings, can spot it and reject its installation. Unfortunately, people usually use Recommended/Quick settings which work in favor of PUP developers. These settings do not openly disclose about third-party download offers. It means that when you install freeware under these settings, you give indirect permission to install the whole software bundle without knowing what hides inside. In order to remove Newtabtools.com from the browser, you have to check the list of programs and browser extensions. Some of the recently installed programs are responsible for keeping the hijacker on the system. Hence, you have to get rid of it. The guidelines below will show you how to succeed with Newtabtools removal. However, if these instructions seem complicated, you can simplify the task by scanning the system with reputable anti-malware and resetting affected browser. Here, look for Newtabtools.com or any other recently installed suspicious programs. Wait until you see Applications folder and look for Newtabtools.com or any other suspicious programs on it. Now right click on every of such entries and select Move to Trash. When in the new window, check Delete personal settings and select Reset again to complete Newtabtools.com removal. Once these steps are finished, Newtabtools.com should be removed from your Microsoft Edge browser. Here, select Newtabtools.com and other questionable plugins. Click Remove to delete these entries. Now you will see Reset Firefox to its default state message with Reset Firefox button. Click this button for several times and complete Newtabtools.com removal. Terminate unknown extensions that are related to Newtabtools.com. Here, select Newtabtools.com and other malicious plugins and select trash icon to delete these entries. Click Reset to confirm this action and complete Newtabtools.com removal. Here, select Extensions and look for Newtabtools.com or other suspicious entries. Click on the Uninstall button to get rid each of them. Here, look at the Homepage field. If it was altered by Newtabtools.com, remove unwanted link and enter the one that you want to use for your searches. Remember to include the "http://" before typing in the address of the page. Now you will see a detailed dialog window filled with reset options. All of those options are usually checked, but you can specify which of them you want to reset. Click the Reset button to complete Newtabtools.com removal process. ^ Browser hijacker. Techopedia. Online tech terms. ^ Los virus. Los virus. Spanish cyber security news. ^ Danny Palmer. What is malware?. ZDNet. Technology news, analysis, comments and product reviews. This entry was posted on 2018-03-26 at 07:21 and is filed under Stealing programs, Viruses. You can quickly scan the QR code with your mobile device and have Newtabtools.com manual removal instructions right in your pocket. How did you remove Newtabtools.com?